All the plants in this book are found in Australia. Ros Shepherd gained her Master of Science degree from The University of Queensland in 1966 and Master of Agricultural Science degree from The University of Melbourne in 1984. She spent many years as a Senior Entomologist at the Keith Turnbull Research Institute in Frankston, Victoria working on the biological control of pest plants and animals, which included research in South Africa. Ros has been actively involved in the Weed Society of Victoria and Council of Australasian Weed Societies for many years. 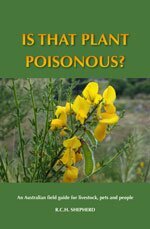 Her other recent publications include The Biology of Australian Weeds series, Plants of Importance to Australia: a Checklist, Pretty but Poisonous and Weeds of the South-East. She is a keen gardener and bush walker and now spends much of her time travelling, in Australia and around the world, photographing plants.